Tennessee state capital in Nashville, 1862. On February 25, 1862 Nashville, Tennessee became the first Confederate state capital to fall into Federal hands. L.K. 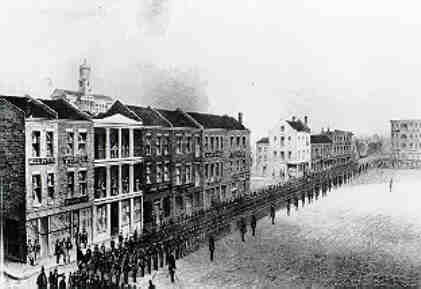 Harris and the 36th Indiana were among the first Union troops to enter the city on that beautiful spring day. The 36th had left their camp eleven days earlier on Friday, February 14th–a cold, snowy morning. They marched hard thinking they were perhaps bound for Louisville. When they stopped for the night, the wagon train had fallen behind and there were no tents. They slept exposed in the cold. these waters were very high, all the valleys along the same being innundated. Frequently the steamers would for a shorter route leave the main channel and pass over farms, and by houses with the first story filled with water and the family in the upper, with their boats cabled to the building. The Woodford, in the advance, reached the landing at Nashville February 25, closely followed by the Diana, with the 6th Ohio, General Nelson and staff. The 36th Indiana and 6th Ohio were the first Federal troops that entered the city, driving out the few remaining rebel cavalry. General Nelson advanced to the State-house with the 6th Ohio and raised the stars and stripes thereon. The 36th Indiana advanced through the city by the court-house square and Main street, the rebel cavalry retiring before it at a respectable distance. The first review of Federal troops in Nashville, February 1862. Bull Nelson situated his camp on the Murfreesboro Pike just outside of Nashville, and he called it Camp Andrew Jackson after his military hero. Here the 36th would stay for several weeks. Here, on March 1st, L.K. Harris was promoted to First Lieutenant. 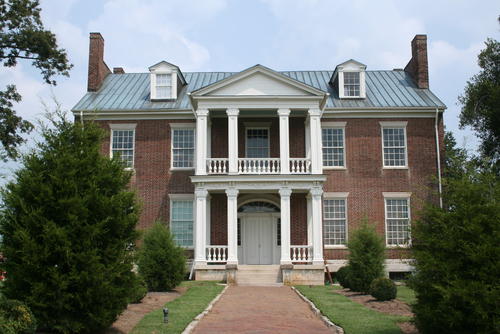 Andrew Jackson’s home, the Hermitage, near Nashville. Robert Best’s diary is at the Allen County Public Library Genealogy Center. Robert Best’s letters are found at the Allen County Public Library Genealogy Center. To see Maurice William’s letter to his brother see the American Heritage Center site. This entry was posted in 36th Indiana Infantry and tagged Andrew Jackson, Bull Nelson, Fall of Nashville, Hermitage, Nashville, Woodford. Bookmark the permalink. Though I have only recently discovered it, this is an outstanding blog! Hi, this is Ross Reller, great grandson of L.K. Harris. I am curious about why he returned to Nashville, where he worked and resided and whether you have any additional info about his work life in Nashville as an implement dealer. Thanks! Ross, I did get some more information about his Nashville years just last year. I will email you directly about it in the next few days. Thanks! Have you reached the end of the files and information in your possession? I ask, because I notice you haven’t posted for a few years. Are you making the information into a book? I do not understand why this question is here.